Are you interested in computer programming? Well, you may be interested with what will I serve to you now. The International Olympiad in Informatics (IOI) is one of the most recognized computer science competitions in the world. The competition tasks are of algorithmic nature; however, the contestants have to show such basic IT skills as problem analysis, design of algorithms and data structures, programming and testing. The winners of the IOI belong to the best young computer scientists in the world. The IOI is one of the International Science Olympiads. The primary goal of the IOI is to stimulate interest in informatics (computing science) and information technology. Another important goal is to bring together exceptionally talented students from various countries and to have them share scientific and cultural experiences. Students compete on an individual basis, with up to four students competing from each participating country (with around 81 countries in 2004). The students compete individually and try to maximize their score by solving a set of informatics problems during two competition days. The problems have been algorithmic programming problems to be solved on a personal computer. Cultural and recreational events are organized on the remaining days. Well, if you're still at Junior High School, prepare yourself from now on, so that you can join IOI later on. Want to know more about IOI? Click here to open IOI Official Site! 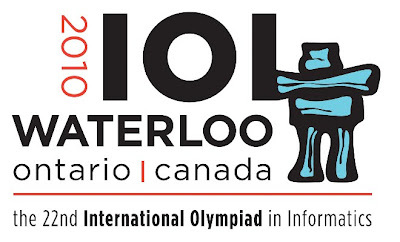 - This 22nd IOI will be held at Waterloo, Ontario, Canada, August 14-21 2010. - For Indonesian students, you must pass from OSN first to represent Indonesia at IOI. - The tests will be about programming and logic (logic math included).